Concrete is a striking and practical choice for countertops, made from a DIY-friendly materials that enables any confident homeowner to achieve quality results. The brute strength of concrete has made it the go-to building material for a variety of such outdoor installations as driveways, walkways, and patios. But there are some who love concrete not only for its high durability and low maintenance, but also for its distinctive look. In fact, probably due in part to its affordability, concrete has become a popular countertop material in both kitchens and bathrooms. What makes concrete an even more budget-friendly option is that—in contrast to, say, natural stone—it’s easy to work with. 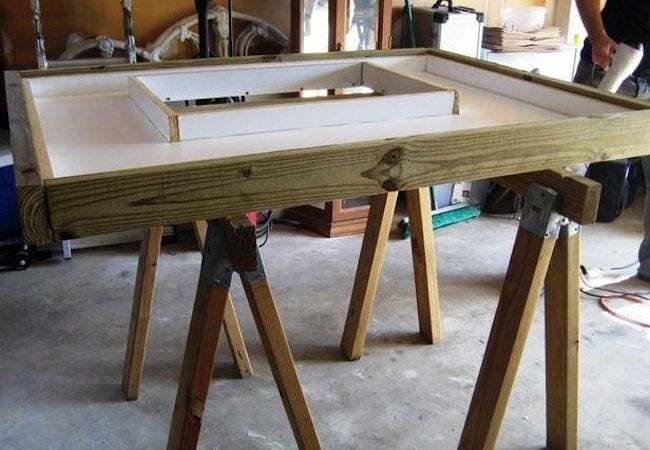 A proficient or even beginning do-it-yourselfer can make a concrete countertop himself, saving the costs associated with hiring a contractor to do it. If you think you’re up to the challenge, scroll down to read the details of the process. Who knows? Soon you might find yourself making concrete countertops the DIY way! Start by determining the dimensions you want the countertop to be. 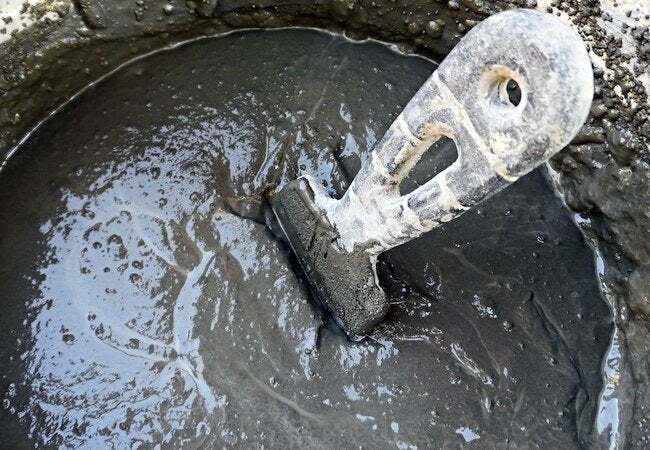 Next, build a form into which you can pour the concrete so that once it dries, the hardened material will conform more or less exactly to your desired specifications. For this type of concrete form, melamine-coated particleboard works best; it’s readily available, inexpensive, and most important, concrete doesn’t stick to it. Caulk all joints in the melamine construction to ensure that the concrete dries with neat edges. If you have only limited experience with caulk, it’s recommended that you outline the joints with painter’s tape. That way, if you misapply any caulking, you can painlessly correct the mistake by just removing the tape. To smooth any imperfections in the caulk bead, run a wetted finger along the silicone before it dries. 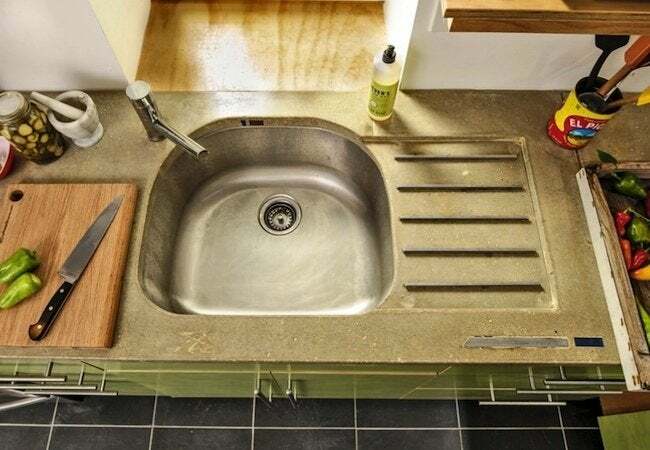 Is your concrete countertop going to be inset with a sink? If so, the form you build must include cutouts for the sink itself and (if necessary) for a faucet. To leave room for these fixtures, you can build recesses into the form (as in the picture above). Or you may be able to get your hands on a foam mold of the sink and its accouterments—manufacturers often make these molds available, not so much for DIYers, but for the contractors who do this stuff every day. Yet another option—perhaps the easiest—is to buy a sheet of high-density foam of the same thickness as your countertop. Cut the foam into pieces of the appropriate length and width, then sand their edges and cover the pieces with foam tape (sold at hardware stores). Finally, use caulk to secure the foam pieces into the right positions within the melamine form. Now lightly coat the melamine frame interior with olive oil; doing so will let the concrete slip more easily from the frame later on. 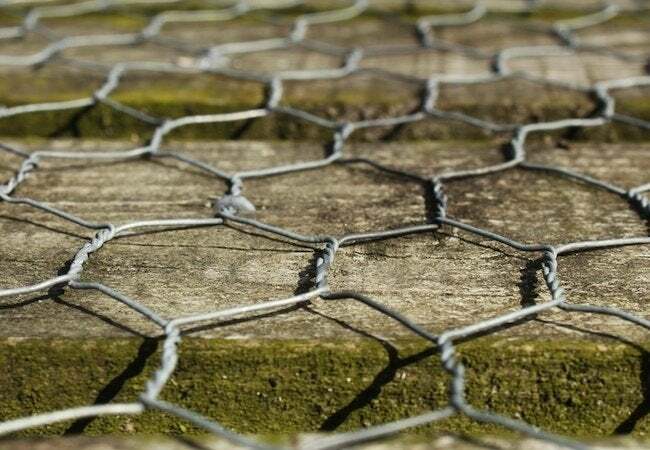 Before you can even think about pouring the concrete, however, one essential step remains: adding reinforcement, in the form of steel mesh. For best results, suspend the mesh at the middle point in the vertical height of your melamine form. How? Drill screws into the outside walls of your frame; connect the mesh to the screws via zip ties, strong ties, or even a bungee cord; then extend the metal wiring across the breadth of the frame. Bear in mind that in order for this approach to be successful, you must be careful to mix the concrete to a watery—but not too watery—consistency. If this all sounds painstaking, consider the alternative: Mix the concrete however you like; pour it to fill the form halfway; set in the steel mesh; then fill the rest of the form. When you’re ready to mix concrete for the project, closely follow the manufacturer’s instructions. Aim to achieve a thick, oatmeal-like consistency. If you find that it’s too hard to work with, add a little water (but only a little). The wetter the concrete, the more brittle it becomes upon drying. Consider augmenting the concrete with additives that inhibit cracking and shrinking. Known as admixtures, these ought to be readily available at your local home improvement retail store. 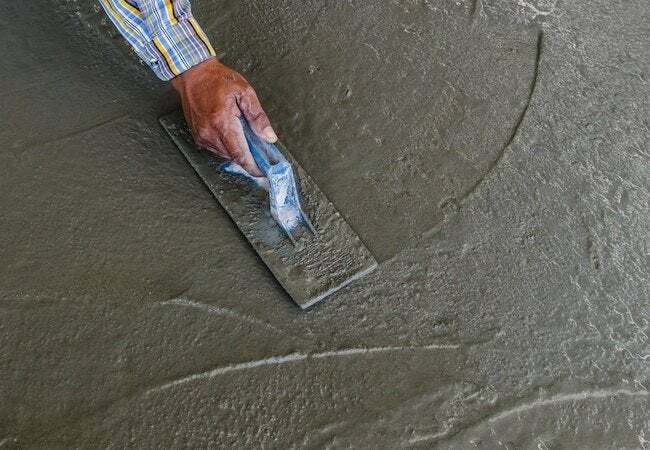 Pour enough concrete into the form to fill its volume completely, then use your hands to work the material along the edges and into the corners. If you attached the steel mesh reinforcement to the frame itself, cut those connections now. Then proceed to use a flat board, such as a one-by-four, to level, or screed, the concrete. Move the board back and forth in order to smooth the surface and fill low spots. Keep a trowel at the ready, so you can quickly deal with any excess. 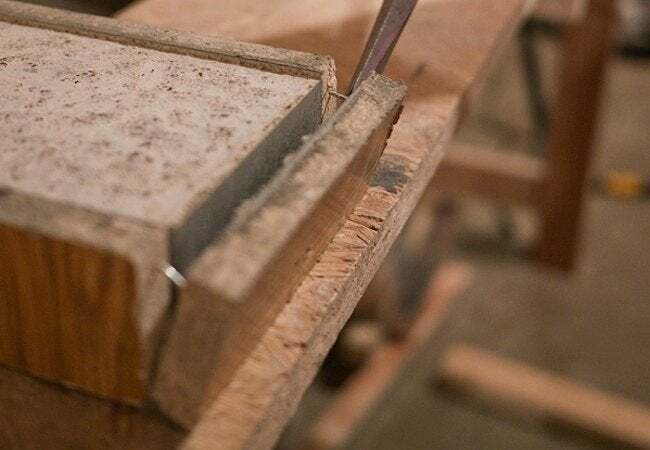 Next, use a wood float, raising its leading edge slightly, to smooth the concrete further. Meanwhile, tap the sides of the form gently with a rubber mallet (or grab a partner and shake the form side to side very lightly) so as to create the vibrations necessary to dissipate air bubbles. After letting the concrete harden for a couple of hours, come back to the form and once more run a tool over the concrete surface. This time, reach for the trowel and use it to eliminate any lingering imperfections. Lay a plastic sheet over the concrete to prevent it from losing too much of the moisture it needs to cure properly. Generally speaking, the longer you allow the concrete to dry, the stronger it ends up being. For maximum strength, you can let the concrete harden for a period of weeks, but for this purpose leaving it alone for a few days is plenty. Once that time has elapsed, go ahead and remove the melamine frame, then lift the concrete countertop into position on top of your base cabinets. There’s a good chance at this point that small cracks or bubbles may be visible in your countertop. If you like them, do nothing. Otherwise, you can perform spot repairs with concrete patching compound. 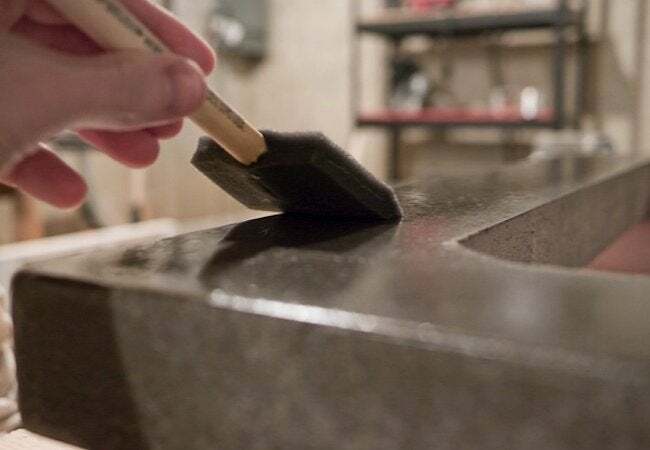 Remember, however, that after applying the patches (and allowing them to dry), you must then sand the countertop with diamond-grit sandpaper (manually or using a power sander). Finally, wash the counter thoroughly, removing all debris and fine particles of dust; let the countertop dry completely, then finish the job by applying a concrete sealer or a coating of food-safe polyurethane (optionally followed by an application of canuba wax). Stand back and admire those concrete results!